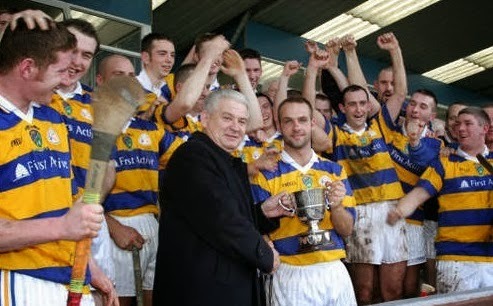 This week's photo shows captain John Paul Keohan receiving the County Intermediate Hurling Championship trophy from County Chairman, Paddy Joe Ryan following Abbeyside's thrilling last minute, one point victory over Erin's Own in the 2003 decider played at Walsh Park. The win meant a return to the senior ranks for the first time since relegation in 1997. Others celebrating inlcude John Hurney, Shane Briggs, Mark Gorman, Gary Hurney, John Kindregan, Damien Cliffe, Paul Breen, John Phelan and Laurence Hurney.